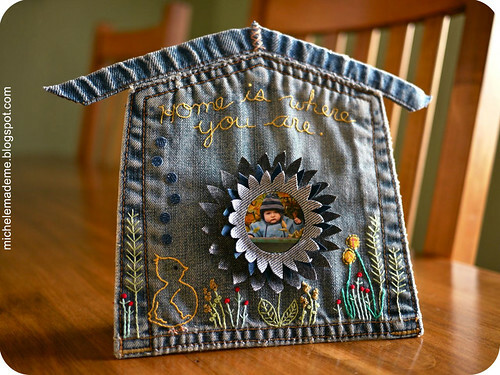 As you can see, this little project combines an upended blue jeans pocket and yesterday’s Denim Photo Flower Tutorial along with a sprinkling of embroidery to create the Pocket House Picture Frame. “The Pocket House Picture Frame Tutorial and Template” is happily esconced in the shop. I hope you’re having a sunny Saturday. See you Monday! Una idea maravillosa con un bonito trabajo!!! So cuuuute, Michele! I love the upended pocket shape for the house and the seams for the roofline – truly clever! Beautiful embroidery design, I love it much. LOVE the embroidery. I love how your mind sees new shapes and designs out of ordinary things. Too cute! You are so clever!!! I just love it!!! The embroidery is so beautiful!!! Oh that is adorable! Beautiful embroidery too! Your embroidery is delicious! Beautiful work, Michele. This is fantastic.